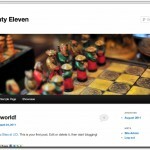 One of the new features of WordPress 3.2 is the new theme, Twenty Eleven. It is now the default theme for new sites and comes with some interesting features. New Post Formats – Post formats now include Aside, Gallery, Link, Quote and Status. Custom Link Colors – Using a color wheel, you can change your site’s link color. 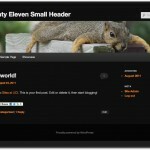 Multiple Layouts – Twenty Eleven has three different layouts including a left sidebar, right sidebar or no sidebar. Large Header Image – The new header image is larger. 1000 pixels x 288 pixels. You can select one of the provided images or upload your own. 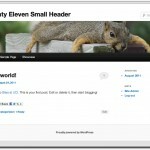 WordPress.com has an article that describes the theme’s features in more detail.